The Role of an Endscopic Surgical Skill Qualification Holder of the Japan Society for Endscopic Surgery on Education of Laparoscopy-Assisted Distal Gastrectomy. Background and aim) Laparoscopy-assisted distal gastrectomy (LADG) has been widely accepted because of its minimum invasiveness. However, it is difficult to develop the techniques of LADG. 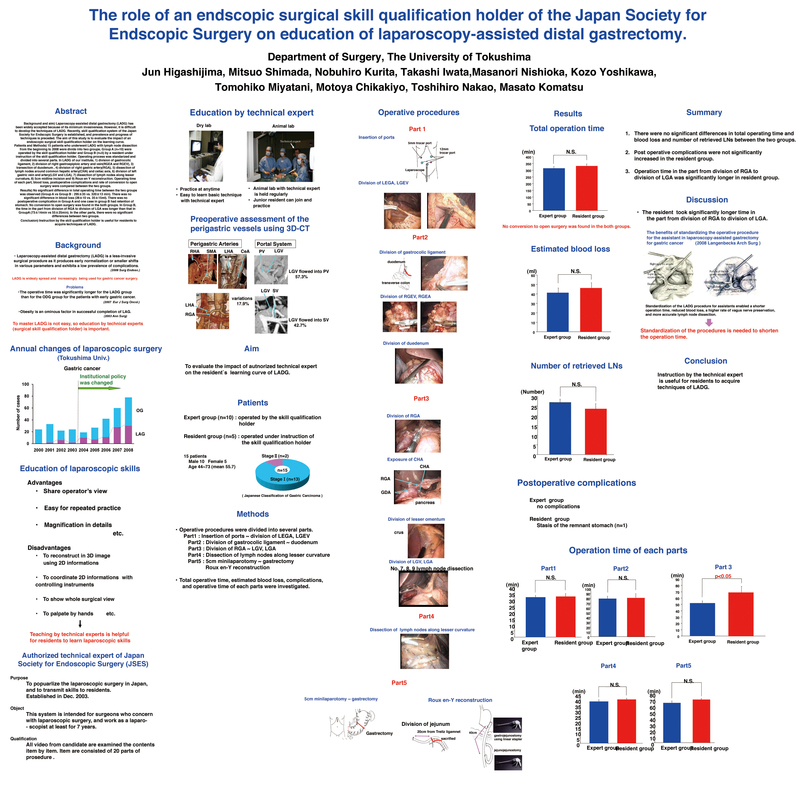 Recently, skill qualification system of the Japan Society for Endscopic Surgery is established, and prevalence and progress of techniques is preceded. The aim of this study is to evaluate the impact of an endoscopic surgical skill qualification holder on the learning curve. Patients and Methods) 15 patients who underwent LADG with lymph node dissection from the beginning to 2008 were divide into two groups; Group A (n=10) were operated by the skill qualification holder and Group B (n=5) by a resident under instruction of the skill qualification holder. Operating process was standarized and divided into several parts. In LADG of our institute, 1) division of gastrocolic ligament, 2) division of right gastroepiploic artery and vein(RGEA and RGEV), 3) transection of duodenum , 4) division of right gastric artery(RGA), 5) dissection of lymph nodes around common hepatic artery(CHA) and celiac axis, 6) division of left gastric vein and artery(LGV and LGA), 7) dissection of lymph nodes along lesser curvature, 8) 5cm midline incision and 9) Roux-en Y reconstruction. Operating time of each part, blood loss, postoperative complications and rate of conversion to open surgery were compared between the two groups. Results) No significant difference in total operating time between the two groups was observed (Group A vs Group B : 295±35 vs. 320±13 min). There was no significant difference in blood loss (28±10 vs. 35±15ml). There was no postoperative complication in Group A and one case in group B had retention of stomach. No conversion to open surgery was found in the both groups. In Group B, the time in the part from division of RGA to division of LGA was longer than that in GroupA (73±14min vs 55±25min). In the other parts, there were no significant differences between two groups. Conclusion) Instruction by the skill qualification holder is useful for residents to acquire techniques of LADG.